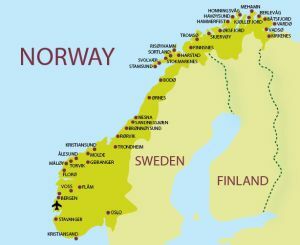 I have been to most places you can get to on mainland Europe by sea but the southern part of Norway has always escaped me. It is all fjords. Editor-in-Chief Malcolm Ginsberg reports. See also SEPTEMBER CRUISE NEWS. A quick look at the brochures last summer found a number of cruise lines offering packages including NCL (Norwegian Cruise Lines) with Jade, a ship we last travelled on back in 2009. Norwegian Jade was clearly the perfect answer, with a Norwegian Captain and just out of a major refit. You need to book 12 months ahead for the most popular cruises. Southampton is Britain’s largest cruise port, both in terms of ships based at one of the four terminals and those liners just visiting for the day. In just a few hours 20,000 people can easily pass through. The city copes well and for us the quayside Holiday Inn is a fine night-stop with the ability to park the car. Jade routed Stavanger, Hellesylt, Geiranger, Flam, Alesund, Haugesand and Oslo. Our 10-night cruise is misleading in some ways as it only shows two sea days, out and back from Southampton. Jade left Stavanger at 14:00 and did not arrive at Hellesylt until 08:00 the next morning, and likewise Haugesand to Oslo is 24 hours at 16 knots and homeward bound we left Oslo at noon, with one and a half days at sea ahead of us. We enjoy our sea days, particularly when the sun is out. If I have one gripe on what was a very pleasant trip it is that NCL did not have any lecturers on board to tell us more about Norway. We were briefed on the port packages by well-informed staff, but those details could also be picked up from the cabin video and the brochures available. The history of Norway, both Viking and modern, needed to be said. All the major ports have a hop-on hop-off bus tour that goes past the dockside. These supply a first class way of seeing a community, if expensive. Hardly anyone actually gets on and off, and some go round twice! No need for tenders at all on this voyage, Norwegian clearly having a priority on dock space (the name says it all) and virtually every port allows the passenger ships easy (walking) town access. First stop was Stavanger chosen as the European Capital of Culture in 2008. Just a short uphill walk from the quayside Old Stavanger has been meticulously preserved with many of its wooden cottages converted into art galleries and boutiques. Linking to the past is the Canning Museum in a former factory which is now odour free from the days of sardines. We thought it would be a bore but that was far from the case. In this authentic environment, the production of canned brisling and fish balls can still be seen. A meander through the busy centre of the little town brings you to the Norwegian Petroleum Museum, a highlight of the whole trip. Follow on film the descent of a diver to the very base of an oil platform. The amazing, and very modernistic exhibition takes you through the whole of the history of oil, and its significance to Norway and its economy. In many ways it shows the justification of Norway standing outside the EU. Norway’s third busiest cruise port, Geiranger is 70 miles inland from the North Sea through some of the most awe-inspiring landscape seen anywhere in the world. It is a World Heritage Site. Best described as quaint Geiranger dies in the winter with a resident population of just 250. But in the summer 300,000 pass thorough. Somehow it has an air of tranquillity about it that the similar Inner Passage Alaska villages do not. Mind you some of those can accommodate up to 12 ships. Prior to arrival mid-morning we dropped off some passengers who undertook a day tour from Hellesylt, at the head of another small fjord. Large modern cruise ships have the ability to dock just about anywhere, and then spin around within their own length. Amazing. The tour took passengers into a kaleidoscope of mountain farms, waterfalls, lakes and rivers emerging at the summit of Dalsnibba Mountain nearly 5,000ft above sea level. 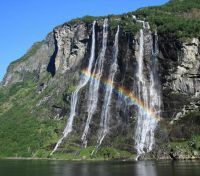 They arrived to find it fogbound, even more aggravating as those who had stayed on the ship to hear the Captain’s wonderful description of the Seven Sisters waterfall as Jade made her graceful way up the fjord, found the afternoon tour sunny and bright. For some of the hardier of folks on board the hike to Storseterfossen was more than worth the effort culminating with a walk behind the deafening falls. Geiranger is certainly a one-off. Flam is located in one of the world’s longest and deepest fjords, the 126 miles Sognefjord, over 4000ft deep in places. 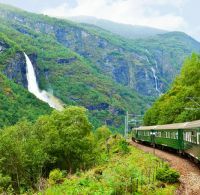 It is a dramatic setting with its focus the Flam Railway which is one of the wonders of the railway engineering world. Flam itself could be described as a typical Norwegian fjord village sitting at the top of yet another natural inlet far away from the sea. Flam lies just 10 miles to the south the Oslo – Bergan railway passing by at Myrdal, tantalisingly close, but 100 years ago only accessible via a poor and very steep track. The 12.6 mile track is the steepest standard-gauge railway in Europe and from 1924 took nearly 15 years to construct through some formidable terrain. Tourists come to Flan not just waterborne, but by rail as well, making the change at Myrdal. We went straight up and back with the train stopping at the Kjoss waterfall getting wet as a legendary Huldra, a red cloaked seductive forest creature dances and sings in the mist. There is a free railway museum at Fram station. Visit if you can before ascending. It will give you a very interesting understanding of what you are about to see. Back it was into a coach to the Stegastein view point which juts out nearly 100ft from the mountainside 2,000ft above the water. The ride alone, along a narrow road, is worth the price. On what was a very busy day we then joined the crowded “Vision of the Fjords”, a purpose-built fjords small tourist boat, to Gudvangen at the end of Nærøyfjord. Another bus and into a tunnel that went on and on for seven miles, out into the sunlight and then underground for another three miles. Not far away is the 15.2 mile Lærdal, the world's longest road tunnel. Perhaps not as well-known as Bergen or Tromso (not visited this time around), Alesund is the fishing capital of Norway. It has just been boosted by a much improved air service with Norwegian and SAS connections via Oslo. A tourist bureau is by the dockside with free wi-fi (and in most places on the trip). It is an easy walk into the centre virtually surrounded by water. One of Norway's most beautiful towns, renowned for its Jugend-style architecture and art nouveau style. It is built on islands extending to the sea, and offers scenic views of fjords and the Sunnmore Alps. Once a chemist shop Jugendstilsenteret is a national interpretation centre, in the centre where visitors can learn more about the town fire 1904, the rebuilding of the town and the Art Nouveau style. The only stop on the whole trip where it was not particularly practical to walk into the town, although many did. It claims to be “The Homeland of the Viking Kings”. A courtesy bus was provided for those not on a tour. Arriving at 08:00 and a quick disembarkation means that it was a bit sleepy at first but came to life later in the day with a film festival imminent. Marilyn Monroe’s family was reputed to come from the locality and a statue of the screen idol sits on the waterfront. A 20-minute scenic drive away at the end of an enviable fjord is the Arquebus Defence Museum telling the story of the Norwegian resistance to the Germans in World War II. Once again we moored near the city centre, most useful as the 16:00–24:00 overnight sounded like a long stay, but in practical terms very limited. Oslo deserves at least three nights and is easy to get to from the UK by plane, but like all of Norway it is not cheap. The weather was wonderful and our visit coincided with a jazz festival. 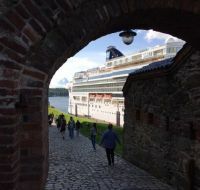 Just by the dockside is Oslo Castle and its splendid grounds, a fine entrance way to the city. It is not too much of a climb and from the top you can turn right towards the extremely modernistic Opera House opened in 2008. 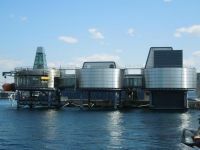 Designed by the International Norwegian architectural house Snøhetta it won the culture award at the World Architecture Festival in Barcelona in October 2008 and the 2009 European Union Prize for Contemporary Architecture. Our walk took us through Oslo Station, from a different design era (1882) and now cleverly converted into a combined shopping mall and end of the line terminus. With the evening available dinner was taken at the Grand Hotel, situated in a very central location on the main thoroughfare, the Karl Johans gate, between the Norwegian Parliament building and the Royal Palace, sumptuous and the subject of a recent multi-million makeover. The meal, a combination of Norwegian and international was taken in the splendid ‘Grand Café’, where Henrik Ibsen used to eat every day. Worth a visit is the rooftop lounge, clearly the ‘in’ meeting place and ‘young things’ of Oslo. Don’t worry about the bar charges, the view is worth the price alone. Which brings us on to Alfred Nobel, he the Swedish inventor of dynamite and much more. Each year the hotel hosts the annual Nobel Peace Prize banquet but his connection with Norway baffled us. A visit to the Nobel Peace Institute, with the current exhibition dealing with refugees and their massive problems, did not help. There was a small exposition on Nobel and his very beginnings, and that was that. Nothing really about the man himself. He never married but had a number of long-term girlfriends, was a true European speaking six languages, and spent a year in the United States at the end of his teens. He left his fortune to found the prizes that bear his name in chemistry, literature, medicine, peace, and physics. The connection with Norway? Nobody at the institute could immediately tell us, but back in Nobel’s time Sweden controlled what is now Norway and the will itself was approved by the Norwegian Parliament. Time did not permit us to visit the Viking Ship Museum, the Open-Air Folk Museum, the Kon Tiki, or the multitudes of interesting places that Olso offers. Many took the hop-on hop-off bus from the quay and just stayed on board. Ninety minutes for the round trip, a bit tight due to the timings of both the ship and the bus company but a fine overview.